2017 Update: We still stand by this advice on how to stay connected to the office on maternity leave— links have also been updated below. So, yay to the boss for protecting that mom’s maternity leave. But it’s an interesting topic with a lot of dimensions. 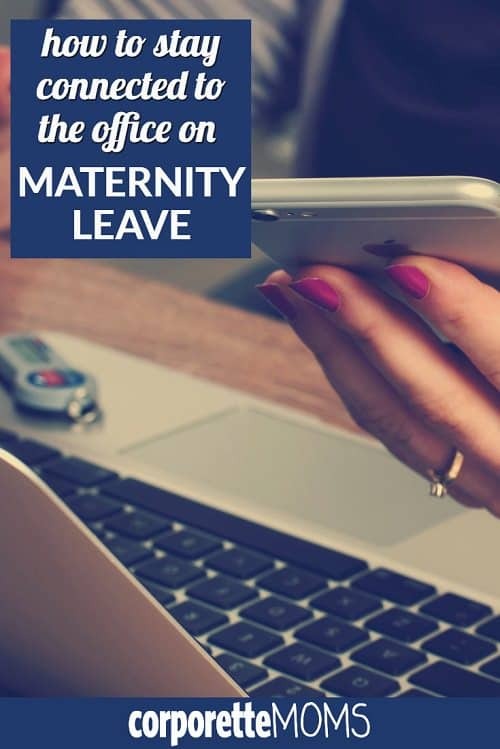 How connected SHOULD you be on your maternity leave, and how should you keep in touch with your office? How available should your employer EXPECT you to be? If there’s a mismatch in expectations, what does it mean for your career prospects? This may be a case where understanding and managing expectations is the key. If your boss expects more than you’re willing to give, what are the best ways to scale back those expectations? If you want to work during your leave and be more involved/available than your employer predicts, should YOU reset your expectations? I’m a lousy example here because I was self-employed during my own maternity leaves, so they were both a “leave” in name only — I had a lot of content ready to go (mostly because I was worried postpartum hormones would change my sartorial sense or make me unfit to give good bloggy advice), but I was still connected and engaged with the blog(s) multiple times a day. Over to you, guys — what discussions did you have with your employer(s) about availability during maternity leave? What expectations did your partner have? How did all of the external expectations compare to your own internal expectations? Photo credit: Shutterstock / Evgeny Atamanenko. I am looking forward to this timely discussion. My water broke at work last Monday afternoon, three weeks before I was due, before I had started my maternity leave. I had finalized and filed three motions and related pleadings in the morning, drafted another in the afternoon, and then suddenly found myself holding DD by 8:30pm (breech csection). Recovery from surgery has been difficult. My intentions of an organized transition with a case list with statuses and hand off info is unwritten and my office is a mess. I finally did a bit of emailing and my late timesheet yesterday, but now what? I don’t know what my biglaw office expects from me, or should expect. I was in Biglaw for the birth of my two kids, but recognize that my office is special in that almost all of the associates/young partners have young families and they focused on work/life balance. I read emails probably daily because they were on my phone, but I rarely responded to anything. I maybe billed 5 hours each leave (12 weeks, paid) to various email responses and one, short, emergency motion that popped up. Now I’m in-house at a corporation and we turn off email for all employees if they are on unpaid leave. Especially if you are an exempt employee, having you work during an unpaid leave can potentially put the company on the hook for wages. So, my company now does not have very high expectations for responsiveness while employees are on unpaid leave. Also in-house (and non managerial) and I did not do anything on my leave nor was expected to. I was also under the impression that working while on leave could jeopardize my FMLA status and/or disability insurance pay (whether that was true or not I’m not sure). I only took 6 weeks as there’s no paid leave and was not particularly functional during that time so I would have been of little use. Also, all my files were transferred prior to my leave, so someone else was responsible during that time. Mid/senior level big law associate here. I took the standard 16 week maternity leave + a week before my due date. I had pretty much transitioned most of my work to specific people over my leave, so in theory someone was responsible for my deadlines while I was out. I told a few of the partners I work with that I would be checking email and wanted to do a little work once baby was a month old. Luckily, because I was pretty brain dead until about three months in, the few emails I sent asking if they needed me to handle anything were ignored. During my week off before my due date I did do a little work — which I was thanked for doing by both partners and clients. They also told me, jokingly, to stop and rest. After the first month I read my emails a few times a day and occasionally responded to an inquiry. A few weeks before I was supposed to go back I offered to pick up a project that we thought had wrapped up prior to my leave and my assistance was gratefully accepted. I had some institutional knowledge, so it made sense for me to do the work and baby’s daycare spot had opened up and she was going a few hours a day so I had baby-free time. It was also around the holidays and I wanted to give my colleagues a break after having picked up my extra work. And for a strictly selfish reason, it was the end of our billable year and I was slightly short of the bonus cut-off. Aside from the bonus (which made me VERY glad I did some work, as it was the year of insane bonuses), it was nice for me to have done a little bit of work to ease my way back in to work. It was also mentioned favorably during my review — which I have mixed feelings about, because I don’t like the idea of setting expectations for other women to do the same, especially if their situations weren’t as conducive to work. I’m not a lawyer so not sure if your world has different rules….put my company prohibits contact to individuals using FMLA for maternity leave. The rule wasn’t really in place after the birth of my first but was very strictly enforced after my second. Same thing with one of my girlfriends at another company. They actually confiscated her phone/laptop during maternity leave. I went on maternity leave toward the end of a large deal I was leading (in-house, not biglaw), and although I had transitioned my work before leave, I answered emails about the deal for the first week or so that I was out. This was totally my choice, though, and I didn’t mind responding to emails I could easily answer on my phone, especially since there was no expectation I would answer immediately. After that first week, hardly anyone emailed me until I was back in the office. I did not do, and was not expected to do, any substantive work while on leave. Toward the end, I suggested to my manager that I listen in on our weekly team calls to get a feel for what was going on, and she told me in no uncertain terms that I was not to join. I probably wouldn’t have minded doing some lighter work toward the end of leave, but all in all I’m happy I wasn’t “allowed” to. Note, though, that I’m still relatively junior in my career (2007 grad), and am not a subject matter expert. If I were, then I think I’d have different expectations — for example, I’d expect more of the “hey, off the top of your head, what do you think about….” type emails. If you’re the go-to person for a particular area, I’m not sure it’s reasonable (right or wrong) to expect to completely disconnect for months at a time. Fortunately/unfortunately, I’m not there yet! I’m a federal prosecutor, and I took 14 weeks of leave (cobbled together vacation time, sick leave, and leave without pay). I obsessively transitioned my cases to other people. By obsessively, I mean that I wrote very detailed transition memos months in advance and updated them weekly. I also met with each attorney taking over any of my matters well in advance. I planned to work right up until birth (which I did), so I made sure to at least partially transition things very early, just in case my departure was earlier than planned. I was still working on my cases right up until the end, but I was regularly copying my colleagues on emails, had already made introductions to defense counsel/agents, asked my colleagues to file their notices of appearance, etc. By the time I left, they were all at least somewhat engaged on the cases they needed to cover, so there were no big surprises when I was on leave. I have a hard time letting go of cases/investigations once I’ve put in a significant amount of time and effort. Because of this, it was hard for me to completely disconnect. It was manageable for me to keep an eye on emails, since they come to my phone. I’d usually scroll through while feeding the baby. But I made a concerted effort to NOT answer them unless absolutely necessary. I was afraid that if I too eagerly answered, my colleagues would begin to rely on me. I answered a few emails, but only when it was clear that a quick piece of information from me would save a colleague time and effort, or when something needed to be quickly clarified. I tried to manage expectations by letting my colleagues know in advance that I did not intend to work during my maternity leave, and I tried to make sure that my level of involvement reflected that intention. It was difficult to let go, but I’m glad that I forced myself to do so. Those 14 weeks are something I’ll never have again with my child, and I’m glad that I largely disconnected from work and focused on her. I had 16 wks paid and was 100% unplugged. I uninstalled my work email from my phone so I wouldn’t be tempted. I didn’t want to peek at my inbox and get stressed by an issue that I didn’t have the ability or bandwidth to fix. I let me colleagues know they could call me or email me at home if they needed to, but no one did. I am also not in law; I work for the federal government. I am just going back to work this week after 8 weeks of maternity leave for my second child. For my first, I was completely disconnected. I didn’t check my email, I didn’t talk to people at work, nothing. This time, I felt differently about things. After the first couple of weeks, I started checking my email almost daily and calling into my weekly staff meeting. I also had a few check-in calls with the person covering for me. I was mostly keeping tabs on things, not doing any work. It really helped me step back in this week. My boss had no expectation at all that I would be available. I was using sick leave and vacation time, so I didn’t have any FMLA or disability pay at risk by working a bit on my own time. I don’t know if I should be asking Kat to post on this topic or not, but I have a question about potentially not returning to work post-maternity leave. I have been thinking about transitioning to another law firm that is much, much closer to home and that has significantly less travel (I have an hour commute each way and will have two children under the age of 15 months once this one is born). The other firm is open to my coming on board when I’m done with maternity leave. My question is when would you tell your current workplace that you are moving on? We had an associate come back from a very extended leave and quit her first week back and it left a bad taste in the partner’s mouths. I don’t want to burn bridges, but I also don’t want to hurt my benefits while on leave (I’m in California and will be receiving a mixture of disability pay and Family Bonding pay – my firm does not offer any paid maternity leave). Would letting them know a month before my expected return date be the best way to go about it? I worked in Biglaw for a little over 2 years in NYC before having my son. My firm had a particularly bad rep for work-life balance, but I was surprised when I got my bonus call a few days before my son was born. My hours had been low that year, but I still got a merit bonus (no extra for high billables). The partner was super nice on the phone and we discussed how my pregnancy had affected my hours and how I dealt with it. I took my full maternity leave and decided I wanted to stay at home and explore other opportunities rather than return. So I went into the office and quit ony last day of leave. I think HR was a little surprised (but not really), my cases were already handed off, and the partners I talked to were almost universally supportive. My dad works at another Biglaw firm at the management level and was the one who recommended not giving more notice. He said quitting on the last day of leave was fairly typical, but I could see how it would backfire in some firms. I think you need to consider how much loyalty people feel to your firm. My firm had really high turnover, even among partners, so I still keep in touch with a lot of people, but most people have left for happier pastures since we all worked together at the firm. Ultimately I started my own business, and I couldn’t be happier. One of the associates in my firm did something like this – about a month (or two – but she took a six month leave) she met with her partners and told them of her plans to leave (she was moving), and they allowed her to stay “employed” through the end of her leave to keep her benefits etc. I agree that you don’t want to let them know too early, but it would be nice to give them a heads up before they start staffing you on projects. Is the other offer in writing? I know this thread is dead but posting Justin case Kat reads it. I’m very interested in this topic. I was looking for a new job in a new field when I found out I’m pregnant. I decided not to switch before the baby but I have no interest in returning to work afterwards–at least not permanently. The most I think I could muster is a few months part time to assuage my guilt about taking the full paid leave. But curious whether that’s the best approach. Biglaw, mid-level associate. I occasionally was contacted during leave (16 weeks) but usually for easy questions like do you remember where I can find X analysis or do you have research in the can re Y issue. I did not bill a single hour during that time. I thought I would want to be more in touch, but I would go days without checking my email at all. Towards the end, I started checking in more regularly just to get ready to be back in work mode. But it felt SO GOOD not to be tied to email. Also, the partners called me when we got a great result on a case that I had worked on for a really long time as one of the key associates – it was so nice that they wanted to share the good news with me and they thanked me for all my hard work. I checked my e-mail whenever I felt like it during leave, and I had so many long nursing sessions and unexpected napping sessions that I ended up checking it quite a bit. It was nice to keep on top of staffing changes, social stuff, keep up on client projects that I would step back into when I returned. I don’t think I responded to many (or maybe any) and nobody had any expectation that I would stay in contact (large regional law firm). However, the week I got home from the hospital with the baby, a partner called me and asked if I would come back to work to close a deal that had suddenly kicked into high gear. I was horrified that he would even ask, because I was pretty much a walking malpractice liability between the sleep deprivation and PPD. I managed to hand the deal off to a colleague, which was an amazing feat of mental strength. I went out on leave as a senior associate. I was on conference calls as they wheeled me to the OR to give birth. And, I drafted a motion the day after I gave birth (c-section). So, I wouldn’t say I unplugged. I was in a hard position because partners kept *saying* that I would unplug and not be available, but then each kept emailing me *quick* questions. I probably worked 5-10 hours a week every week during the first 16 weeks. I then took 8 weeks unpaid, and worked about the same amount. I will say, though, that another woman that had a baby the previous year had a wildly different experience. So, maybe it’s just the way I handled it? I’m not sure. I am a teacher who had unpaid FMLA. I was expected to come up with daily sub plans during my leave (all the prep for that was UNPAID) and to post work for my students at least weekly during my leave. I also came in about 1 week post-partum to meet with my sub before the school year began. My sub also called me at home a number of times and my principal email me over my leave asking me to make changes to my lesson plans. Wow, that is some serious BS. I’m sorry you were in that position. So, I took a very organized approach as well to my leave – both with my first and second. Especially with my second, I knew I could give birth anytime in that last month. (I work for an association in a non-legal role.) The people that I was passing my projects off to and I worked very closely together that last month knowing that I could give birth any time. That was helpful in that had I given birth early, everything was put into place for her to take over. As for expectations, I met with my boss (who is great) and our HR person to discuss my plans, expectations and details. I think because the company I work for is very staff focused and places importance on family and balance (if that exists…), that I was able to set the expectations for my leave. I ultimately took off 4 months and passed off all my projects but one to two of my colleagues. And because I worked with them early on, things were not a mess when I came back. During my leave, I said that after 6 weeks, I would work on my remaining project from home in the time I found available. I also discussed this with my husband (who works from home full time), so that if I had to do something during normal work hours that he could help out for an hour or so for a conference call, or to meet a deadline. But I honestly worked maybe 4 – 5 hours a week – sometimes at 11pm, sometimes on a Saturday, but it helped me stay connected to my office in a sense and have some adult conversations that weren’t about spit up, breastfeeding or what was in the baby’s diaper. For the other projects I passed off, I did check email (my own choice) so that I knew what was going on, but never responded to any of them, save for the occasional, how’s baby, how are you, etc. I found that it was really important for me to feel somewhat still connected to my job. No one talks about how isolating maternity leave can be, and how much work it is. I would love to know how some folks have completed ‘maternity leave projects.’ I was lucky to get a shower and return a few emails from friends. My baby didn’t sleep, still doesn’t, so while I thought I might try to get a few fun projects underway, the reality was very different. Anyone who is planning for these types of projects, please keep this in mind. I’m so glad I took all 4 months, but man, it was REALLY hard. I had my child while a law student, so no maternity leave here (though I did take a reduced courseload and missed two weeks of class after the birth.) I obviously stayed connected when I returned to class. However, I wanted to chime in with my partner’s experience of taking parental leave as a non-mother primary caregiver. He works for an amazing nonprofit that has a union contract that allows employees to take up to six months off to be primary caregiver for a new child. He still gets full benefits. None of the time is “paid” but he can use sick leave and vacation (both of which are allotted generously). I think he ended up getting paid for about 3.5 months at the full time rate. He has now shifted to a very, very part time schedule – five hours a week. This lets him join meetings on on-going projects that he cares about and will return to when his six months are up. Anytime he worked before during his “paid leave” he logged the time as working and the company didn’t use his vacation time to cover it. If your partner’s organization will let him or her do something like this, I’d recommend it. (I don’t think it would work so well for the mom if she can take disability – I didn’t have this option, so don’t know if it would or wouldn’t work.) This has worked really well -it has prevented him from working for free, lets him keeps his hand in projects, and has also helped with our division of childcare labor because it more clearly delineates between when both of us are on duty and off duty (when you are a student or studying for the bar, it’s important to make sure that just because you are home, you aren’t on duty! It’s easier for me to work from home because of breastfeeding, but it’s hard to keep from playing/caring for the baby instead of working.) This kind of gets to Kat’s question – I would be upset if my partner used his paternity leave to get ahead if it meant that I was not free to do the same. If we were both taking leave and I ended up doing most of the house and child work while he did career work, I’d be really pissed. This is why it was so important for us to be clear about who is on duty when.